A Return to Plessy vs. Ferguson? Apparently there is no known picture of Homer Adolph Plessy, the loser in the seminal Supreme Court case, though this picture is over and over said to be Plessy. An astute reader, Jordan, caught my mistake. This is actually P.B.S. Pinchback, a history maker in his own right, and, ironically, part of the group that orchestrated Plessy’s arrest as a planned action to challenge segregation. Read more HERE. Note: This article considers a monograph by Rick Guzman, my eldest son, the co-founder, with his wife Desiree, of Emmanuel House, which in 2016 was named one of the “Top 100 Most Innovative” social change organizations in the world. Also in 2016 Guzman for Aurora promoted his run for mayor of Illinois’ second largest city. A biographical sketch follows below, but first consider his important NIU Law School monograph on educational equality. It led in part to his receiving the Thurgood Marshall award upon graduation. 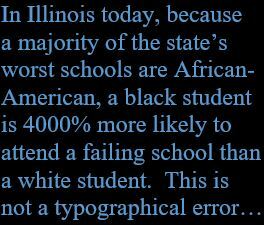 “In Illinois today, because the majority of the state’s worse schools are predominately African-American, a black student is 4000% more likely to attend a chronically failing public school than a white student. This is not a typographical error—not 50% more likely, which would be a tragic disparity, not twice as likely, or even 10, 20, or 30 times more likely, but 40 times more likely.” This fact comes from Diane Rado, Darnell Little, and Grace Aduroja’s article “Still Separate, Unequal,” on page 1 of the May 9, 2004, Chicago Tribune. (See a reproduction of this front page below.) The situation hasn’t improved significantly in the years since. Some have suggested it’s worse. Plessy vs. Ferguson. 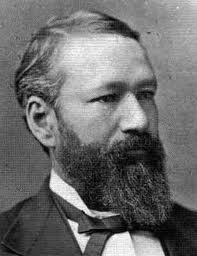 In 1892, Homer Adolph Plessy, an “Octoroon”—that is, someone 1/8th black—took a seat in a “whites only” car of a Louisiana train, thus violating a Louisiana law mandating racial segregation on its trains. He refused to move to the car reserved for blacks and—though he was 7/8ths Caucasian—was arrested. In a 7 to 1 vote the Supreme Court ruled against Plessy, saying, in an opinion authored by Justice Henry Billings Brown, that separate facilities for blacks and whites satisfied the Fourteenth Amendment so long as they were equal. Though Justice Brown conceded that the 14th amendment intended to establish absolute equality for the races before the law, he noted that “in the nature of things it could not have been intended to abolish distinctions based upon color, or to enforce social, as distinguished from political equality, or a commingling of the two races unsatisfactory to either.” The phrase “separate but equal” was not part of the opinion, but by enshrining this concept—the lynch pin concept of segregation—it effectively made discrimmination something Constitutionally lawful. Brown vs. Board of Education. It’s been 60 years since this landmark Supreme Court decision supposedly overturned Plessy vs. Ferguson, but white students have maintained an absolutely overwhelming advantage. As noted above, in Illinois less than 1% of them go to failing schools. 40% vs. 1% is one measure of “white privilege.” Getting a good college education is more necessary today than ever, yet when I bring this privilege issue up in my classes, I always—always—get white students talking about this or that case where a minority student got into college even though they were “less qualified.” However, for every one of those cases—I don’t deny they exist—there are tens of thousands of black youth who never get a chance. You could wait forever to wipe out discrimmination, but since that probably will never happen—because, as the old saw goes, “you can’t legislate morality,” and it’s as tough to legislate social norms—why not at least concentrate on lessening the effects of racism, what many call our country’s Original Sin? Why not, says Rick Guzman, start thinking about ways to spread resources, leveling the playing field a little, so perhaps someday black kids might only be, say, 2000% more likely to go to failing schools. If 50% is, as he says, a “tragic disparity,” 2000% is hardly any cause to rejoice. However, given our glacial progress in the 60 years since Brown, it would still be a huge leap forward. About Rick Guzman: Upon graduating from North Central College in 1999, Rick Guzman became a Mikva Fellow, then special advisor to the Governor of Illinois on issues of housing and anti-hatred. He also helped run the committee which led to Illinois’ historic moratorium on the death penalty, and later helped create projects such as Sweet Beginnings, designed to help prisoners re-enter society and avoid re-arrest. In memory of his brother Bryan Emmanuel (1985-2006), he and his wife Desiree founded Emmanuel House, an organization helping refugees and the working poor lift themselves out of poverty. He directed Community Christian Church’s Lighthouse Project, an effort to develop the east Aurora, IL, community, and served as assistant chief of staff to Aurora Mayor Tom Weisner, overseeing community development. He was given the Learners to Leaders award by his high school alma mater, and, upon graduation from Northern Illinois’ law school, the Thurgood Marshall Award, given to the student who “best epitomizes Justice Marshall’s deep understanding and commitment to equal justice under law, his dedication to the rule of law in a just society, and his use of the law as an instrument of social change.” In 2016 Emmanuel House was named one of the “Top 100 Most Innovative” social change organizations in the world. In the same year Guzman also announced his candidacy for mayor of Aurora. Go Here to learn more. 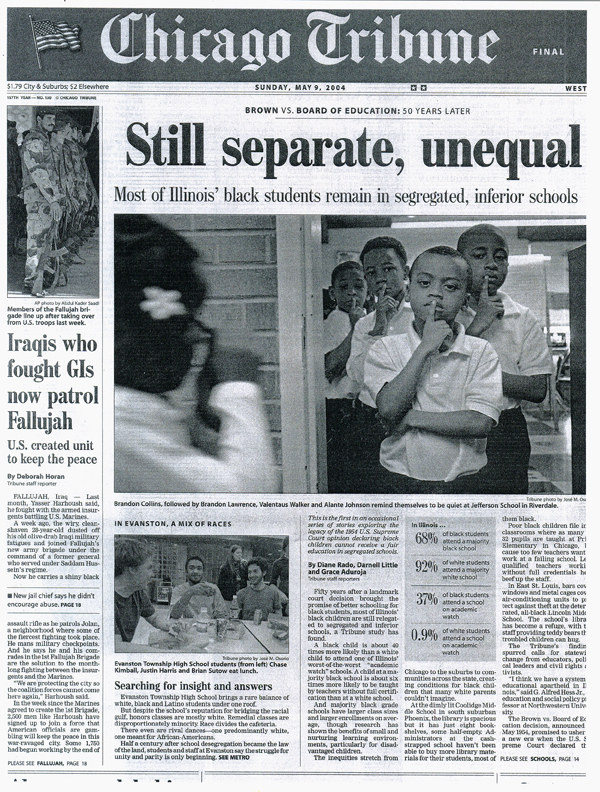 A black & white reproduction of the artile “Still Separate, Unequal” as it appeared on page 1 of the May 9, 2004, Chicago Tribune. This entry was posted in Diversity & Multiculturalism, Social Change and tagged Brown vs. Board of Education, Emmanuel House, Guzman for Aurora, Homer Adolph Plessy, Plessy vs. Ferguson, Rick Guzman, school inequality, Thurgood Marshall, white privilege. Bookmark the permalink.